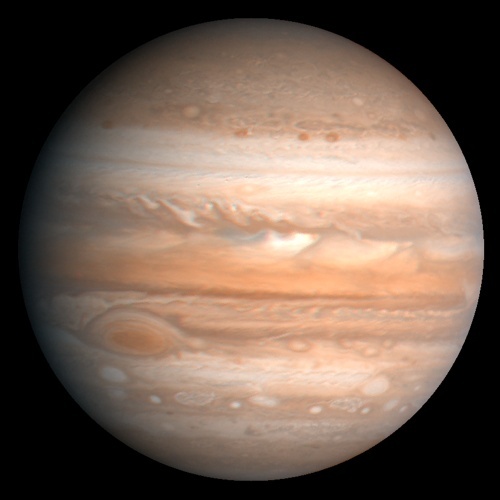 Jupiter is the largest planet in the Solar System and the fifth planet from the Sun. Jupiter is around eleven times the diameter of the Earth and about 1,300 times its volume. However, it is just 300 times as massive as the Earth, as it has a much lower average density. Jupiter is one of the four ‘giant’ planets in our Solar System, along with Saturn, Uranus and Neptune. It is classified as a gas giant and doesn’t have a solid surface. It is thought that Jupiter has a rocky core at its centre, at least 14 times the mass of the Earth, surrounded by a thick layer of metallic hydrogen, an intermediate layer of liquid hydrogen and an outer layer of gas, composed primarily of hydrogen and helium (about 90% and 10% by volume, respectively). The outer layer of Jupiter’s atmosphere is covered with thick clouds of ammonia crystals, which form light-coloured bands known as ‘zones’ and dark-coloured bands known as ‘belts’. Giant hurricane-like storms form in the turbulence between these layers, the most recognisable of which is Jupiter’s Great Red Spot – a storm whose diameter has been as much as three times the size of the Earth. The Great Red Spot was first observed in the 1660s, when telescopes became powerful enough to show detail on Jupiter, and has been raging ever since. Jupiter has a ring system, discovered by the Voyager missions in 1979, although they are much fainter than the rings of Saturn and made of dust ejected from three of its moons, rather than ice particles. Jupiter has a particularly strong magnetic field – about 14 times stronger than the Earth’s – which produces a magnetosphere that is larger in size than the Sun. Plasma particles in parts of Jupiter’s magnetosphere are heated to temperatures that are hotter than any other place in our Solar System, hotter even than the centre of the Sun! Jupiter has 67 known moons (as of 2014). The largest of these are Io, Europa, Ganymede and Callisto (in increasing order of distance from Jupiter), which are easily seen with the aid of a small telescope or even binoculars. They are known as the Galilean Moons as they were first discovered by Galileo in 1610.